OMEGA™ transducer quality strain gauges are available in a variety of patterns to cover most transducer design requirements. Their rugged construction, reliability and flexibility make them suitable for highly accurate static and dynamic transducers. The measuring grid is formed by specially formulated etching constantan foil, which is then completely sealed for long term reliability in a carrier medium composed of polyimide film. To select the proper size gauge, the first number in the part number indicates the overall active gauge diameter. 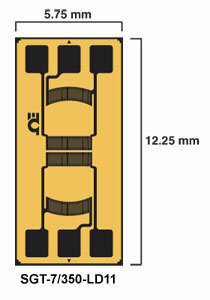 Nota: Sold in packs of 5 strain gauges.